The Climate Caravan organized by WWF and supported by RoGBC will stop tomorrow morning in Bucharest. This Friday and Saturday, from 10:00 am to 6 pm, you can visit the Caravan in Herastrau Park, at the entrance from Charles de Gaulle. The WWF team was really pleased with the Constanta event and is looking forward for the rest of the tour. Anca and I will be there on Friday, while for Saturday – Brandon (Epstein) volunteered. If interested, don’t hesitate to drop by :). 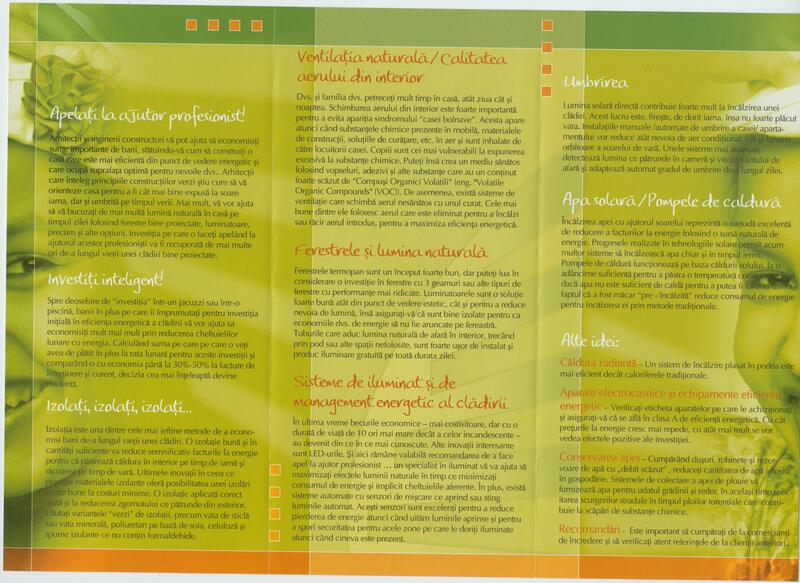 As RoGBC marketing materials, we prepared 2 RoGBC banners and 3500 brochures on Saving Money by Building Green (Economisiti bani construind verde). Please see below a scanned version of the brochure [it’s a bit darker than the original]. September 13, 2008 at 8:47 pm | Posted in Training | Enter your password to view comments. September 11, 2008 at 4:29 pm | Posted in Events, Legislative Outreach | Enter your password to view comments. September 9, 2008 at 6:24 pm | Posted in General | Enter your password to view comments. We have prepared a RoGBC Founding Member logo that you, as founding members, can use in your communication and marketing materials, including your website, business cards, etc. If you decide to use the logo online, on your website – please link it to the Romania Green Building Council website. If you need the logo in print quality, please contact me at laura.nemoianu@RoGBC.org. The RoGBC Legislative Outreach Task Group’s comments were integrated into the letter sent last week by AmCham Romania to the team that is drafting the Romania’s National Strategy for Sustainable Development. 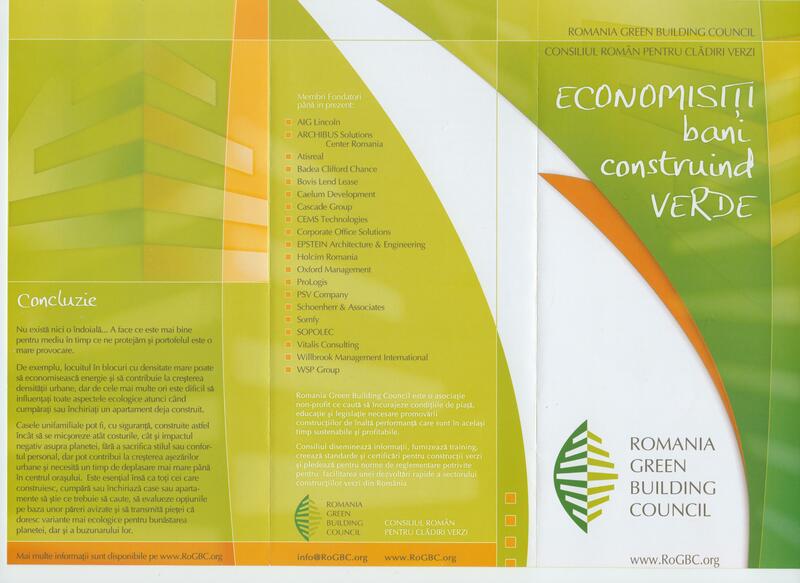 In the letter, Romania Green Building Council is recognized as being the main provider of comments/information related with sustainable construction. The National Strategy for Sustainable Development (both the RO and ENG version) can be accessed here. Our comments can be accessed here. I would like to thank all the members from the Legislative Outreach Task Group for getting involved in the discussions. If you want to get included in this or other Task Groups going forward please let me know by sending an e-mail to anca.bieru@rogbc.org. September 1, 2008 at 5:01 pm | Posted in Events, General | Enter your password to view comments.